What are the City Tournaments? The city touranaments are generally held every second weekend. Players from all cities can join the tournament and the city's aggregate score is calculated and cities ranked accordingly. The top ten cities in each tournament wins gold, the number of which is calculated as a percentage of the city's expansion costs. How is the Gold from Tournaments used? Each season, the city votes on how to distribute all sources of gold. Currently, gold won from tournaments is distributed to participating players, based on their ranking in the tournament. For example, if we win 22 gold that gold will go to the top 22 players in the tournament. However, in order to qualify for gold you have to either complete all three of your tournament games and/or be one of the top 15 players in the city (ie the scores which actually count towards our placement). Any surplus gold (ie because we earn more gold than we have players) goes to the city treasury. How Do I Join the Tournament? To join the tournament you enter the official tournament channel by clicking the mode button on the game screen in the tavern and choosing official tournament from the drop down list. 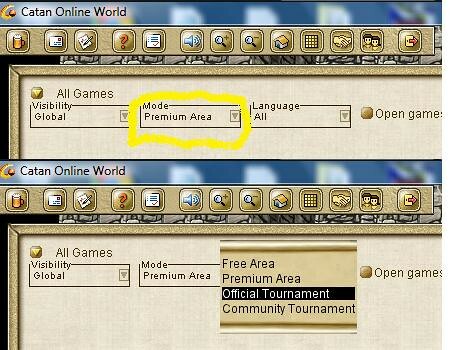 Once in the tournament room you can join an existing game or open one of your own. Please note that for the Catan boards games, only four players games are permitted and you cannot join a game with anybody from the same city (Katimavik Bay city number is 15). When Do I Need to Play? The tournaments run for the full weekend, starting at server restart on Saturday (1000 Catan time) and continuing until server restart on Monday. In order to be ranked in the tournament, you need to play three games during this period, but you can choose when you want to play. Our recommendation is to try to play in the evenings as tournament games with players from the other English speaking cities tend to be more fun than playing during European peak hours. You can only play three games. If you are unable to finish a game, that will still count as one of your three games, except that you will receive a zero score for that particular game. Whilst we understand that losing connection or other unforeseen circumstances can prevent players finishing a tournament game, it is really imporant that do not quit when playing in tournament. The city is affected not just by the loss of points but it is also extremely damaging to our reputation, particularly since most uncompleted tournament games result in the game being aborted, which causes enormous frustration for all the players involved. If a game is going badly, you will gain much more respect for seeing it through than by quitting. How Can I See Where I'm Ranked? Rankings for both individual players and each of the cities can be seen by clicking on the scroll in the tavern and choosing the option "tournament statistics". From there you can sort by player, by city etc. Please note that rankings are not finalised until the end of the weekend as other players may still overtake you after you have completed your games. How are the City Scores Calculated? Cities scores are calculated by taking the scores of the top 15 ranked players from each city and dividing their total aggregate score by 15. Where a city has less than 15 people enter, the missing scores are recorded as zero and the aggregate still divided by 15, so it is important to try to get at least 15 people to enter every tournament. What If I Don't Know the Game? What are the Marathon Weekends? There are two marathon weekends each season - one for the boardgames and one for Rivals of Catan. The boardgames are chosen through a poll of all users, while the Rivals covers all six current themes. The marathons are held over three games (Fri, Sat, Sun) and the aim is for players to play as many games as possible during that period. As points are scored in every game played, it is important to play a lot of games, even if you are not winning. Are the Rules the same for marathons and normal tournaments? No. Besides the fact that you can play as many games as you want, you can also play 3 player games instead of 4. This makes it easier to get games going and there will also be a lot more players available to play because there is no restriction on the number of games they play. However, you still cannot play against anybody from your own city and suspended games must take a sub from the same city as the player who left. Why is it important to participate in the Marathons? Unlike the regular tournaments, which take the average of the top 15 scores in each city, the marathon results divide the total points scored by the city by their active citizen factor. So with approximately 60+ active citizens, we really need a big turnout in the marathon for our score to be worthwhile. *The score of this tournament does not count towards the Champion value or the value "City of Champions." The three best cities in the "Catan Marathon" receive special statues (gold, silver, bronze) and gold for their city treasuries (according to the formula for regular tournament weekends described above).